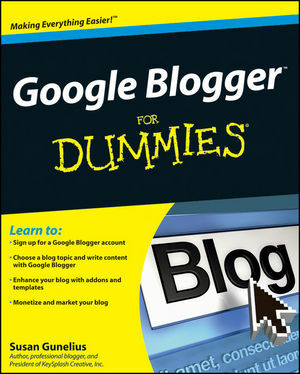 Google Blogger is a great choice for beginning bloggers, and Google Blogger For Dummies gives you the know-how to venture confidently into the blogosphere. Susan Gunelius is President and CEO of KeySplash Creative, Inc., a full-service marketing communications provider. She is also a professional blogger and seasoned marketing and branding expert with two other books to her credit. In addition to being the Guide to Web Logs for About.com, she authors blogs for a variety of clients as well as her own blogs, WomenOnBusiness.com and KeySplashCreative.com. Part I: Introducing Google Blogger. Chapter 1: Choosing Blogger as Your Blogging Software. Chapter 2: Welcome to the Blogosphere. Chapter 3: Blogging Basics and Buzzwords. Part II: Using Google Blogger. Chapter 4: Getting Started with Blogger. Chapter 5: Setting Up Your Blog. Chapter 6: Writing and Publishing Blog Posts. Chapter 7: Enhancing Your Blog with Templates. Chapter 8: Adding Features and Functionality with Elements and Gadgets. Chapter 9: Managing Your Blog. Part III: Making Money with Blogger. Chapter 10: The Business of Blogging. Chapter 11: Maximizing Revenue with Google AdSense. Part IV: Growing Your Audience. Chapter 12: The Power of Networking and Relationship Building. Chapter 13: Boosting Your Search Engine Ranking. Part V: Extending Your Blog. Chapter 14: Growing or Downsizing Your Blog. Chapter 15: Blogging from Different Media. Chapter 16: Moving Beyond Blogger. Chapter 17: Ten Useful Social Networking and Social Bookmarking Sites. Chapter 18: Ten Common Blogger Problems and Possible Solutions. Chapter 19: Ten Places to Find Free Blogger Themes and Templates.